DESCRIPTION: This course is designed to teach basic motor skills, judgment, safety, proficiency, and patrol procedures for the motorcycle trainee to become qualified as a motor officer. This course meets all mandates and requirements as set forth by POST. INSTRUCTOR: All instructors are POST certified and veteran officers with a wide range of experience. PREREQUISITE: All students must have an M1 Endorsement. Must be a full-time or part-time law enforcement officer. All students must be in good physical condition and free from prior injuries that may be aggravated by physical activity. Students should have basic civilian motorcycle skills. All Non-Alameda County students must also sign a liability waiver. Class will be limited to 8 motorcycle officers. No exceptions. HOURS: This is an 80-hour course that will be presented usually from 0800 to 1700 hours each day. Night ride hours 1300 - 2200 hours. 4. 200 rounds duty ammo. 5. Agency motorcycle required on the last day of the first week as well as the full second week. Basic training motorcycles, for days 1-4, are provided by this facility at no cost to the student/agency. It is required that the students' Agency provide their Full Dress Departmental motorcycle for day 5 of week #1 and the entirety of week #2, upon successful completion of days 1-4. Our primary training motorcycles are Harley Davidson Road King (ABS). It is also highly encouraged that students receive motorcycle pre-training to ensure they have the basic skills needed to start the course. 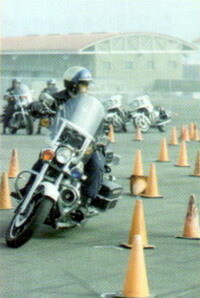 Alameda County Sheriff's Office also offers a Motorcycle Skills Orientation course. Please contact EVOC Coordinator, Deputy Kerri Hansen for more information at khansen@acgov.org. RESERVATIONS: This course is limited to 8 students and reservations will be made on a first come, first serve basis. Use the link below to submit reservations. If you have any questions, please contact Melisa Tolero at (925) 551-6970 or EVOC Coordinator, Deputy Kerri Hansen at (925) 551-6987 or khansen@acgov.org. PAYMENT: Payment due no later than the 1st day of course. Acceptable forms of payment include cash (exact amount), check (payable to Alameda County Sheriff's Office) and credit card, note there is a 2.49% non-refundable fee.